I made my stew yesterday in my Le Creuset Casserole which D got me six years ago from Jenners, a famous department store in Edinburgh. I remembered him carrying the heavy bake ware on the train. Ah that’s love. D really enjoyed this stew especially the gravy. He said his parents who enjoy their meat with two veg would like it too. For me, it was okay, the flavour of cider in cooking is still new to me. I liked the dumplings though, soft herby scones that melt in your mouth. We have enough left over for another meal. So later in the week we’ll be having it again, but it will be with garlic mash, as this is what Rachel Demuth suggests in her book. I’ll let D make the mash though, he puts a lot more love into mashing the potatoes than me. The reason for this is, he loves his mash more than I do. 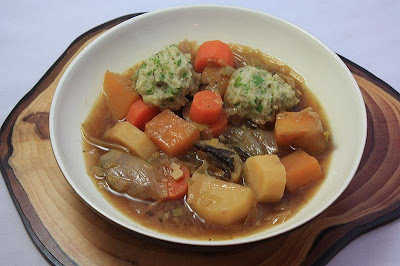 If you do decide to make this stew, ensure that you chop the vegetables in the appropriate size as you want them to cook evenly in the casserole dish. Its not particularly nice, chomping on an undercooked potato, a carrot you can get away with, but not a potato. In a large casserole dish fry the shallots in the olive oil until they are golden. Add the garlic and the leeks and fry for a couple of minutes. Then add the carrots, parsnip, swede and potatoes and cook until the vegetables are beginning to look translucent around the edges. Add the cider and bring to the boil. Mix in the Tamari and Marmite into the boiling water and add this to the stew, along with the bay and sage leaves. Season to taste and simmer gently for 35 – 45 minutes or until the vegetables are nearly cooked. 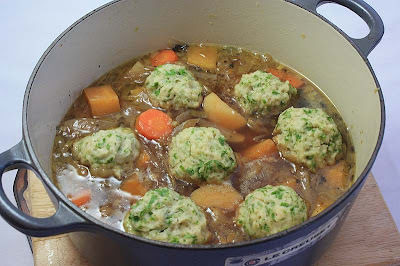 The dumplings need to be added 15 minutes before the stew is ready. In a bowl add flour, vegetables suet, parsley and seasoning to taste. Add enough water to combine and make a firm, not sticky dough. Then with floured hands, break the dough into 8 – 12 pieces and roll them into rough round dumplings. Add them gently to the stew, pushing them down into the liquid. Simmer gently for 15 minutes or until the dumplings have doubled in size. Adapted from Rachel Demuths The Green World Cookbook. Mash is my favourite, I love it really creamy with loads of butter added. This stew looks delicious and just what's needed for these cold days. Mmmmmm, tasty! But, how can you not love mash? Oh those dumplings look so tasty, must ty them out soon. That meal looked winter perfect. That stew looks just wonderful!!! Sorry, I just can't - reminds me too much of baby food. the dumplings were good for sure. oh i love dumplings! was just browsing your blogs and came across this! Thank you so much for repaying the compliment Kat. And its totally vegan too. The dumplings were lovely and light. Marmite is a very British invention. Its actually a yeast extract and has a very powerful 'meaty like' taste. Oh the word you may know Swede by is rutabaga. Anyway, just thinking how does your Hippy Pack idea work? we may just have to do an exchange. Let me know. I already know of one thing to send you - a jar of Marmite! MMM..looks warm! Coming from a tropical country I wonder if seasons make a big difference in the changing price of vegetables and fruits. What kind of fruit is cheap during winter there? That was a good motivation for me to blog more. It's always nice to know that someone can benefit from what I post. Thanks! The prices of things here ony tend to go up. Thanks for the link, I will come by and check it out. Thanks! Just made this, and will be adding to the family's favourites. Really tasty with the soy sauce. Wouldn't have thought to use. Delicious. Thank you.